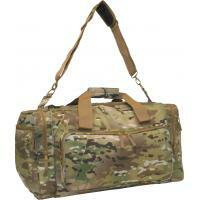 Gym Bag / Gear Bag, Multicam / OCP  - $66.49 : Advantage Supplies, Inc.
Large, spacious design to carry all of your gear. Made with super tough 600D polyester fabric with PVC backing. 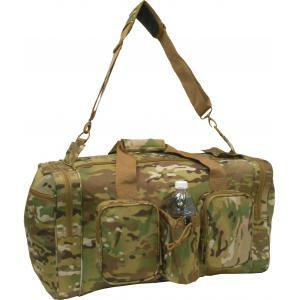 Main compartment has a 5 1/4" wide double zipper flap that allows the bag to open over 21" wide to stow or remove large items such as boots, helmets or other large gear you might be carrying. 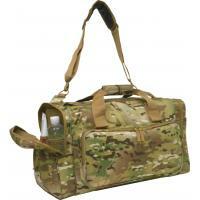 Features two extra-long carrying handles that completely wrap around the bottom of the bag. Very strong 2" webbing is used for maximum strength and support. Padded closure handle secures with hook and loop and provides carrying comfort. Long, adjustable padded shoulder strap, with metal swivel snaps attached to metal D rings for easy and secure carrying. 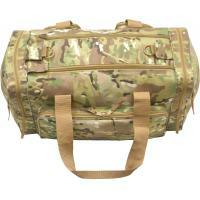 Reinforced stitching at stress points and attractive piping complete the look of this bag. Long, main compartment has a removeable, hard plastic bottom board that is covered with lining fabric to give shape and strength to the bottom of the bag. Bottom exterior of bag is equipped with rubber feet. Overall bag dims: 23.75”L x 12”H, x 11”W; Main Compartment: 19”L x 12”H x 11”W; 2 End Pockets: 12”H x 11”W x 2.5”D; 2 Small Accessory Pockets: 7.75”H x 6”W x 1.75”D; Water bottle pocket. Also available in Coyote (81816) and Black(75816).